The purpose of this activity is to analyze how guppy populations change over time. The simulation activity allows you to start with a pool of guppies and your choice of predators, you will be able to watch what happens to your guppy population and how the introduction of predators can affect the guppy's appearance. The simulation will help you understand what pressures drive guppy evolution. 1. 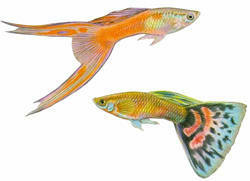 If being flashy and colorful attracts predators, why do you think guppies are so colorful? 2. After viewing the guppy gallery, pick the fish you find most interesting. What is the fishs scientific name, origin and average size? Describe the coloration of the fish you chose. 3. After viewing the predator gallery, pick the fish you find most interesting. What is the fishs common name, scientific name, and origin? 4. View the guppys habitats, what habitat conditions would affect the predator populations? 5. Who is John Endler? What did he study and where did he study it? 8. Describe how predators influence guppy coloration. 9. Was your hypothesis correct, use your data to justify your answer. 10. What does it mean that male guppies live in a crossfire between their enemies and their would be mates? 11. Why do you think guppies in different areas of the stream have different coloration? 12. What would happen to mostly drab guppies that were placed in a stream with very few predators? 13. What would happen to brightly colored guppies that were placed in a stream with many predators?